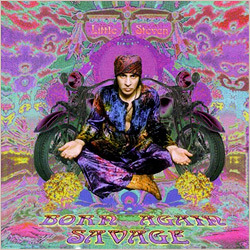 Mit dem Rock-Album "Born Again Savage" kehrte Little Steven zu seinen Wurzeln zurück. Das Album wurde 1999, fast 10 Jahre nach "Revolution" veröffentlicht. A classic second-in-command rocker in the tradition of Keith Richards and Johnny Thunders, Little Steven has also made a mark apart from his erstwhile boss, the Boss. The man also known as Miami Steve Van Zandt had a major hand in Southside Johnny's bar-band masterwork Hearts of Stone, was the linchpin in 1985's Artists United Against Apartheid project, and lead his own group, the Disciples of Soul, for a time after his 1984 departure from the E Street Band. Largely out of the picture through the 1990s, Little Steven returns with a solo outing that rocks harder and is more inflamed lyrically than one might have expected from this long-AWOL warrior. Van Zandt's liner notes lay out his mission--to doff his bandana in the direction of the '60s rockers who helped shape his consciousness, from Cream to the Kinks to Jefferson Airplane. At the same time, he maintains the confrontational political stance that's been in evidence since the days of Sun City. Hence there's the title track ("Look around at the volunteered slavery") and "The Camouflage of Righteousness" ("We give you politicians and you call it a choice / We let you do the voting and you think you have a voice"). With this Savage attack, Little Steven fights the good fight and remains standing. It is the tribute to the hard rock pioneers that kept me alive growing up. The Kinks, the Who, the Yardbird and the tree groups the Yardbird spawned - Creams, the Jeff Beck Group and Led Zeppelin. It`s additionally a statement of profound gratitude to Georg Harrison, the Beatles, the Rolling Stones, and the Jefferson Airplane who first turned me on to Eastern melody and philosophy and forever explanded my cross-cultural consciousness. I must also thank Bob Dylan from whom all lyrics flow, and Allen Ginsberg for being a Buddhist among other things. This is the fifth and last of the political albums I outlined when I decided to make my own records. I wanted to learn about what was going on and write about it, talk about it, and hopefully learn something about myself in the process. After 5 albums and 7 years of travelling and studying and looking around I wrote the following liner notes intended for the original release of this record. We live in an insane asylum. A barbaric, merciless cesspool. And in this purgatory filled with disease and ugliness and violence and hatred and injustice and greed and lies and pain and frustration and confusion there a brief, feleeting moments of oeace and love and truth and beauty. They are rare. They are years and miles apart. But they are so meaningful that they make life worth living. Those moments give you strength to face the insanity with your balance intact and your eyes focused and you endure and tolerance and survive. And if you`re lucky, real lucky, you can tap that strength and hold on to it long enough to, in your own small way., try to make it all a little bit better. Just a little bit more civil and just. To serve. And you don`t do it for anybody else because no one is going to thank you or reward you or even notice. Don`t kid yourselfe. You do it for you. For your own soul. Can you tell me is the white light of near death the light of creation? You know the one from that big bang so long ago? And is reuniting with that energy what we call heaven? Or is what's in your kiss all there is to know?" Why am I never satisfied?" She said, "I will trade my youth for your wisdom"
He laughed and said, "It ain't quite that simple but you got a deal"
She said, "I dreamed I saw Saint Francis"
And he said, "It don't have to be this way"
She smiled, "You first must die before rebirth"
"The fast is over. Tonight we share the feast"
You can't fill your glass if it hasn't been emptied yet"
It's the journey not the destination"
She said, "It's the journey not the destination"